Kommenden Mittwoch, 7. Juni, feiern wir in Santanyí zwei spannende Jahre mit vielen Erlebnissen, Kontakten und Erkenntnissen rund um die Coworking Community von Rayaworx. Es gibt Schnupper-Coworking, Besichtigung des Coworking Spaces und Podcast-Studio, Kennenlernen, … Der Meetingraum ist dann Team Office für alle Coworker, die an dem Tag auch produktiv sein müssen. Im Eingang zum Rayaworx machen wir Marktbesucher auf uns mit einem Glücksrad und temporären Tattoos aufmerksam. Zu gewinnen sind Gutscheine oder Give-Aways von Coworkern und lokalen Geschäften oder Marktständen, leckere Pop-Cakes, und und und. Coworking-Interessierte, Kooperations-PartnerInnen, FreundInnen und Bekannte nehmen an der Tombola teil, die unsere Coworking Community zusammen bringt – per Gutschein für spannende Dienstleistungen. Dazu verlosen wir auch beliebte Rayaworx-Devotionalien. ‚2 Años‘ am 7. Juni 10:30-19:00. Sehen wir uns? On Wednesday, June 7th, we will be celebrating two exciting years in Santanyí, with lots of experiences, contacts and insights about the coworking community of Rayaworx. You may come to try out coworking, have a look into our coworking space as well as podcast room, meet other people from our coworking community… The meeting room is going to be a team office for all coworkers, who need to be productive on the day. At Rayaworx‘ entrance we will attract the local market visitors with a wheel of fortune and temporary tattoos. Prizes are vouchers or give-aways from coworkers and local shops or market stalls, delicious pop cakes, and and and. Coworking-interested folks, cooperation partners, friends and acquaintances participate in a community raffle to connect with other people in our coworking community – by voucher for exciting services. 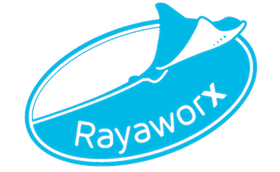 And yes, there will be popular Rayaworx memorabilia, too. ‚2 Años‘ on June, 7th, 10:30 am to 7 pm. Are you in?